A campaign to teach children about copyright infringement on the internet, is employing cartoons and puns on pop stars' names, to get the message across. Even its makers admit it is a "dry" and "niche" subject for a cartoon aimed at seven-year-olds. But the Intellectual Property Office adds learning to "respect" copyrights and trademarks is a "key life skill". And it is hoping the adventures of Nancy and the Meerkats can finally make intellectual property "fun". The series, which began life five years ago on Fun Kids Radio, was re-launched this week with the aim of getting its message into primary schools. 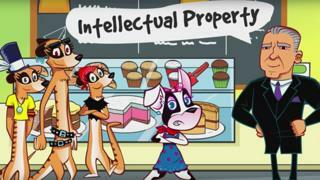 The Intellectual Property Office - formerly known as the Patent Office - has produced a range of teaching materials for Key Stage 2 in the national curriculum, for seven- to 11-year-olds. Most of the lessons are delivered by Nancy's sharp-suited but avuncular manager, Big Joe. The Intellectual Property Office is leading the government's efforts to crack down on internet piracy and protect the revenues of Britain's creative industries. The government agency is spending £20,000 of its own money on the latest Nancy campaign, which is part-funded by the UK music industry. Catherine Davies, head of the IPO's education outreach department, which already produces teaching materials for GCSE students, admitted IP was a "complex subject" for small children and something of a challenge to make accessible and entertaining. But she added: "In today's digital environment, even very young people are IP consumers, accessing online digital content independently and regularly. But some fear the IPO is being too heavy-handed in its warnings about piracy and that the message could backfire. Jim Killock, director of the Open Rights Group campaign, said: "Some of the material seems misleading, in particular the episode explaining that downloading is the same as stealing from a shop. "While it's wrong, it is neither the same in law - as downloading is a civil wrong while theft is a crime - nor is it a convincing analogy. "The IPO risk educating children that copyright law is stupid and immoral by putting forward simplistic arguments like that." The genre has declined since its 1970s heyday, although Charley the cat made a comeback in 2014 in an electrical safety campaign voiced by comedian David Walliams.